Can we all agree, the on-again, off-again talks with North Korea suggest Mr. Trump is desperate for a foreign policy ‘win’ to get the focus off Robert Mueller’s investigation? Can we all agree, Ireland’s vote, repealing a ban on abortion is a recognition of modern realities? Can we all agree, many Americans, see some kind of sinister plot to silence Melania Trump, since the First Lady has now been out of sight for over 2 weeks, after criticizing her husband with her new anti-bullying initiative? Hillary and her Russian hat, a not-so=subtle poke at the President. Can we all agree, it would be hard to find anyone in Washington who understands why the administration felt obligated to save the Chinese firm ZTE? Can we all agree, Iran’s willingness to rescue their nuclear deal with the EU, will, once again, leave the US on the outside looking in, with no opportunity to affect change. Can we all agree, now that the head of the federal prison system has resigned in frustration, it’s only a matter of time before the head of the DHS tires of being Mr. Trump’s punching bag? Can we all agree, the European Union is now setting the standards for internet privacy? That’s why your email has been flooded with new privacy notices this week. 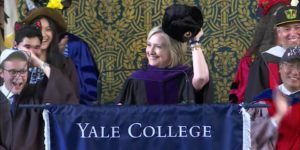 Can we all agree, when Hillary Clinton showed up at Yale Class Day with a Russian-style hat and jacket everyone knew who she was trolling? Can we all agree, the resignation of the president of USC was long overdue? Accusations that a school gynecologist abused patients is the second major scandal at the school in less than a year. Can we all agree, it looks like PGE stockholders will be facing a pretty hefty charge, now that Calfire has blamed the utility for causing the devastating wildfires in Northern CA last fall? Can we all agree, Michael Cohen’s attempts to profit off his relationship to Donald Trump seem to get worse every week, but is he really any different than anyone else in Washington selling influence? Can we all agree, while former Hollywood mogul Harvey Weinstein has been arrested, the impact of his case will be felt for years? Can we all agree, Jack Johnson deserved to be pardoned, but there are probably many more, less well-known folks who deserve the same treatment? Can we all agree, Mr. Trump’s letter. withdrawing from the summit with North Korea is stunning for its tortured style, egotism and attempts at flattery? Can we all agree, the administration’s proposed 25% tax on ‘imported’ cars is one more example of a poorly thought out negotiation strategy? It will hurt more American workers than it helps. Can we all agree, the families of the Sandy Hook elementary school, faced a double-edged sword in deciding to sue conspiracy theorist Alex Jones, but his claims are just too ourtrageous to ignore? Can we all agree, now that Mr. Trump will be forced to allow his critics to access his twitter account, he’s probably a lot less likely to actually read his social media feed? Can we all agree, by caving in to Trump’s demands, the NFL owners showed they have no backbone, and do not care about the players as actual human beings? Can we all agree, Jared Kushner’s classmates at Harvard don’t seem to have much use for the President’s son-in-law? Can we all agree, the soon-to-be-indicted Mr. Kushner, could find his new security clearance, short lived? Can we all agree, California Democrats are panicked that a 2% improvement in Mr. Trump’s approval rating, could doom their plan to retake the House? Can we all agree, the week’s election results revealed a fresh slate of unknown candidates who just might change the face of US politics? Can we all agree, if gas prices and mortgage rates continue their climb, it won’t be long before everyone starts to realize, Mr. Trump’s policies are costing them real money? Can we all agree, both the Russian and Venezuelan elections were corrupt? Can we all agree, there is something wrong with a system that allows two US citizens to be detained just because they were speaking Spanish? Can we all agree, Deputy AG Ron Rosenstein, made the right choice in acceding to Trump’s demand for a probe if FBI intelligence gathering? While Mr. Trump is way out of line, the inquiry will turn up nothing and it will keep the President quiet. Can we all agree, Mr. Trump’s attempt to create an FBI conspiracy might help his ratings but will have little impact on the Mueller investigation? My Bucknell family remembers one of our most distinguished alums, author Phillip Roth, who died this week.